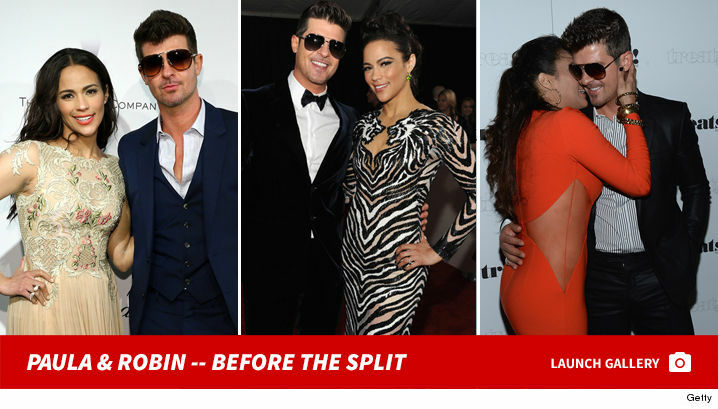 Robin Thicke brought the cops to Paula Patton's home Friday morning because she allegedly violated their custody order by not allowing him to take their son ... but the video dramatically shows Robin walked away empty-handed. TMZ broke the story ... Robin won a victory in court Thursday when a judge refused to limit his custody to daytime monitored visits ... this after the L.A. County Dept. of Children and Family Services launched an investigation into allegations Robin was using excessive corporal punishment on 6-year-old Julian. We're told Robin called Paula after the hearing to take Julian for the night -- which the custody order allows him to do -- but she went radio silent. On Friday morning Robin went to Paula's Malibu home with L.A. County Sheriff's deputies and the court order. We're told the deputies went inside the house and spoke with Julian and he said he was scared of his dad and didn't want to go with him. You see Paula in the video -- obtained by TMZ. Robin is out of frame. The deputies explain they will not take the child against his will. One source connected with Robin says the couple is now close to reaching some middle ground on how to deal with the custody issues.